We’re cutting a new version of firmware for ACCESS and BRIC-Link II codecs that adds a long-sought-for reliability feature. 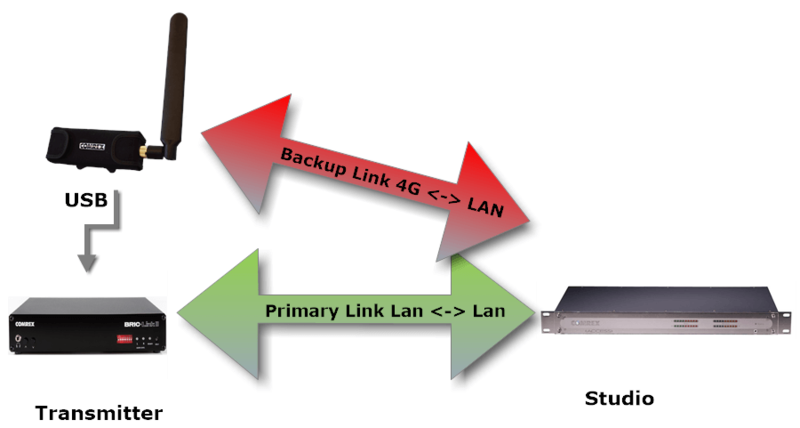 We call it HotSwap, and it allows you to back up your STL or other dedicated links with a wireless modem. It’s an enhancement to our CrossLock reliability layer. Normal CrossLock operation allows the codecs to use the data capability of two or more data networks. You can either “bond” these networks together into one channel (for data constrained networks), or turn on “Redundancy” and send duplicate streams over each. But you can’t designate one network as primary, and a second network to be used only when the primary fails. Because most 4G networks aren’t truly “unlimited” (despite what the marketing says), it can be expensive to run them 24/7. HotSwap allows you to designate one network (e.g. your wireless modem) as a “backup” that will only be engaged when the primary fails. The system will warn of this status with a contact closure, and automatically fallback to the primary once it’s restored. 1) Set up an ACCESS/BRIC-Link CrossLock connection as you normally would for a 24/7 link. 3) Designate this modem in the settings as “backup”. 4) Re-establish the connection and enjoy your sleep! You might have noticed we mentioned BRIC-Link II, which doesn’t currently support wireless modems over USB. Yes, we’ve added support (only for Comrex Connect modems, and only for the backup function). On ACCESS, any supported network or modem can be a backup. Firmware 4.3 is now available for download.